I realized a couple months ago that G acts kind of like an extension of your brain. You think to yourself "how long should I bake this potato, and at what temperature?" You type it in, and boom, your potato is in the oven at 350 for 20 minutes. In this sense, the brain extension can be a bit helpful. Just today I made a search for what to write in a sympathy card. I didn't use my own brain to write a message from my heart. I defaulted to what a couple search results deemed acceptable in this situation. I was well aware of what I was doing, I just didn't want to put in the effort I guess. I use my brain differently and with less intelligence as I would if I wasn't conditioned to use search engines. Somewhere in my brain I know how to bake a potato and what to write in a card. Pre G I would have probably sifted through my memories connecting neurons to retrieve that information. G basically has a record of the human thought process evolving from the late nineties through present day. They have actively changed the thought process of its users, and have a record of that, too. They record everything and have more information about the human psyche than any psychologist could ask for. 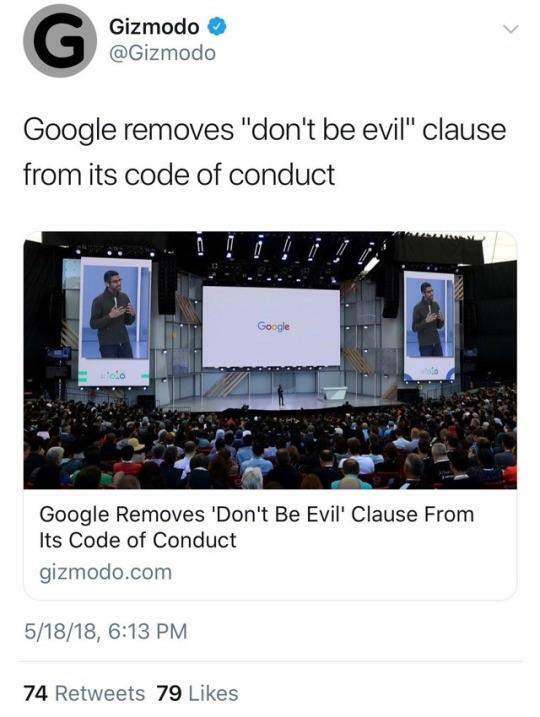 The fact that they removed that bit from their code of conduct is similar to a lot of stuff I notice going on these day. People and entities that may well have always acted in a manner that harms the majority of living organisms no longer feel it is necessary to hide their (evil) conduct. I can only speculate on what might have led G to remove that from their code, but through their knowledge and influence on human behavior they have the power and resources to unleash an unimaginable evil on the world.